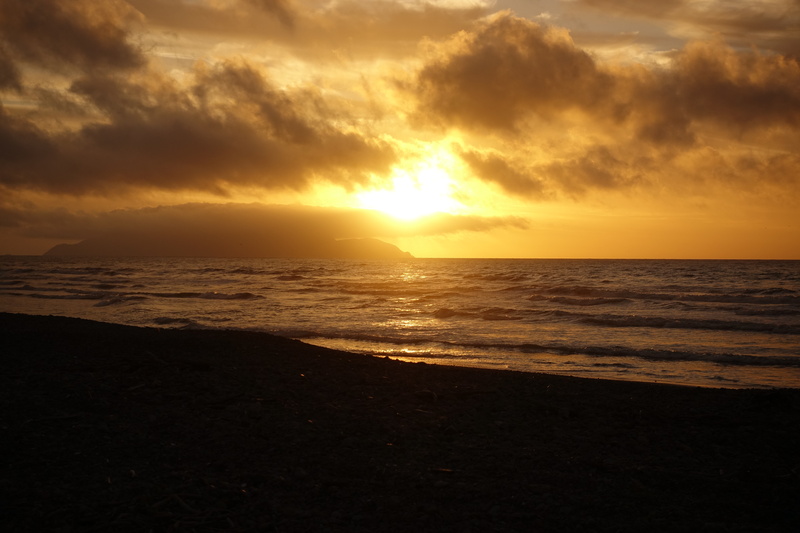 We’ve now arrived safely at the southern part of New Zealand’s northern island, Wellington. 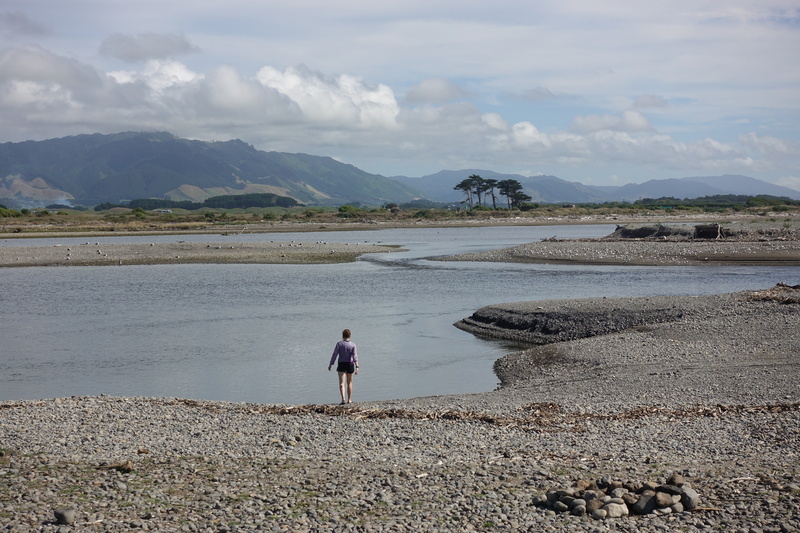 Over the past few days, we got up close and personal with some of New Zealand’s rugged terrain as well as getting to know more of the locals. 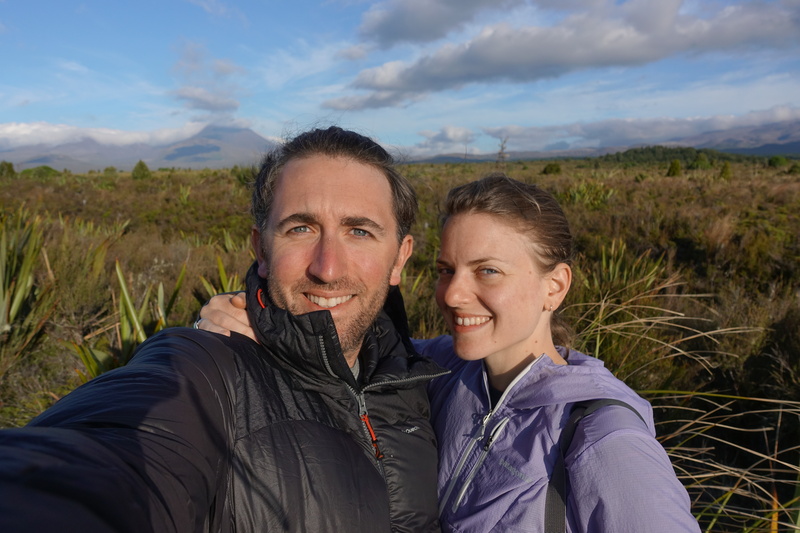 This past Tuesday, Cédric and I took a “day off” from cycling to hike the 19.4 km long Tongariro Alpine Crossing. 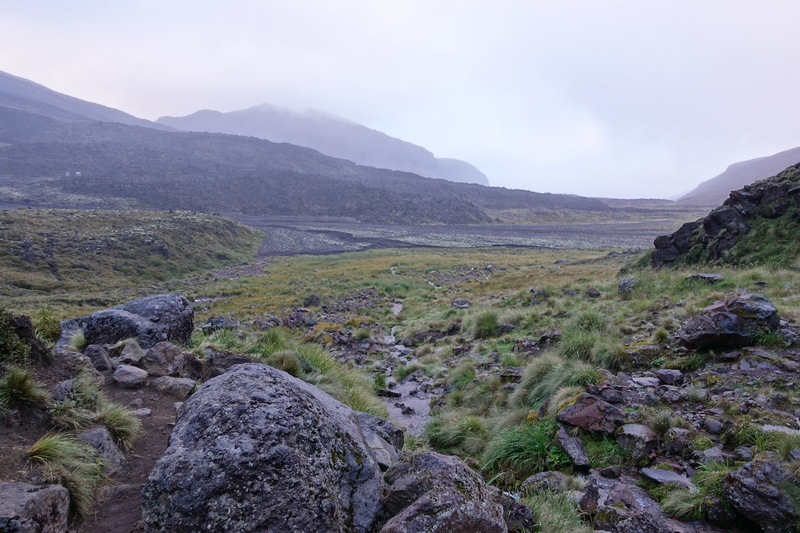 Apparently, the Lonely Planet lists this hike as a ‘life-changing experience,’ but the only thing life-changing about this hike was us deciding never to hike an alpine crossing in the wind and rain again. The day started off with a highly unnecessary early start and bus ride to the trail head at 5:10 in the morning to ‘beat the heat’ … by the time we started the hike, it was still twilight and sprinkling. 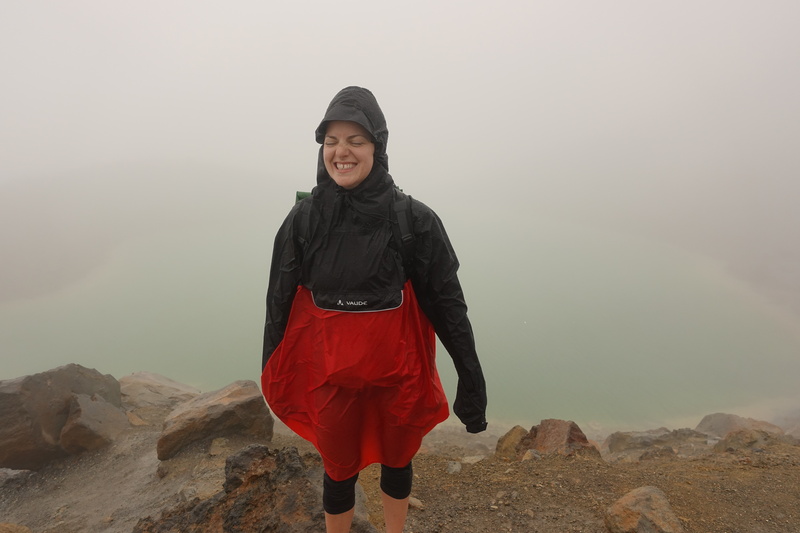 A few hours later, we had the wind and rain lashing our faces at 1800 meters of altitude. 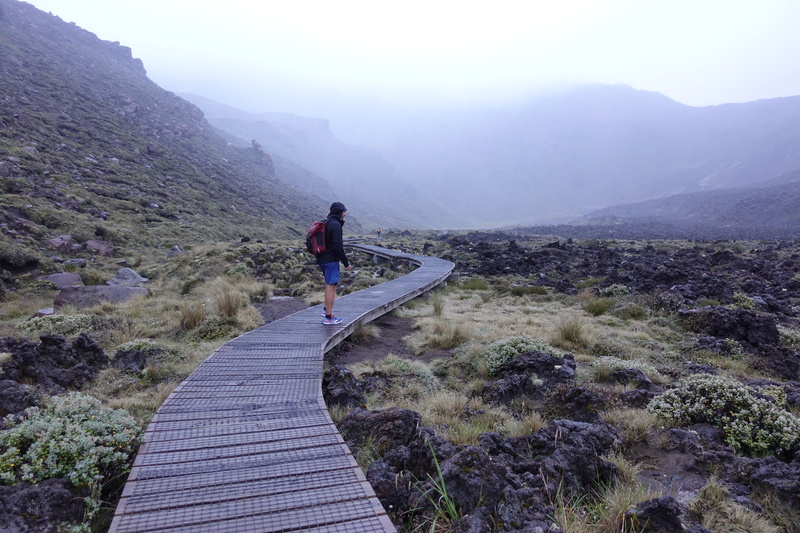 Here, Cédric learned that he should not have listened to the receptionist’s very suspicious advice to take sunscreen, lots of water, a hat, and that it gets very warm up there… he spent half of the hike soaking wet! The hike lasted us 5 wet hours in total, and we were glad to be back at the campground and napping in our warm sleeping bags by 1:30 pm. 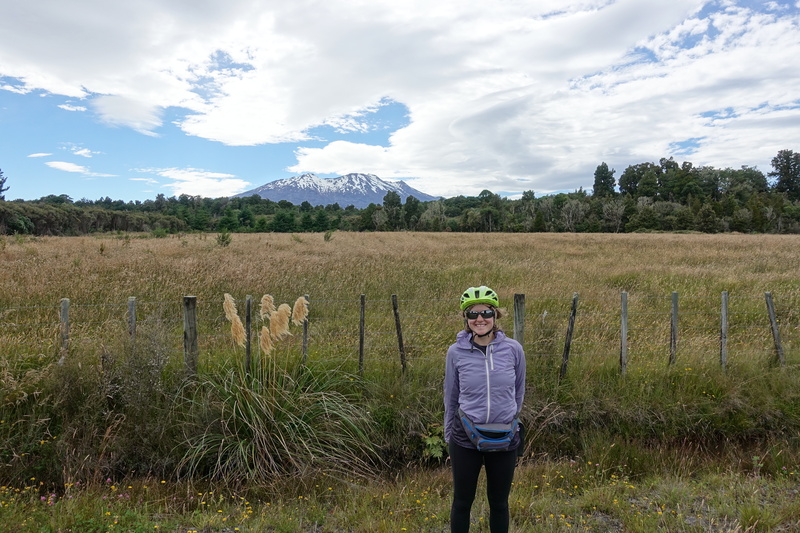 The next day, with a backdrop of storm clouds brewing in the distance, Cédric and I left the Tongariro National Park to the sunnier town of Raetihi a short two-hour ride down the road. 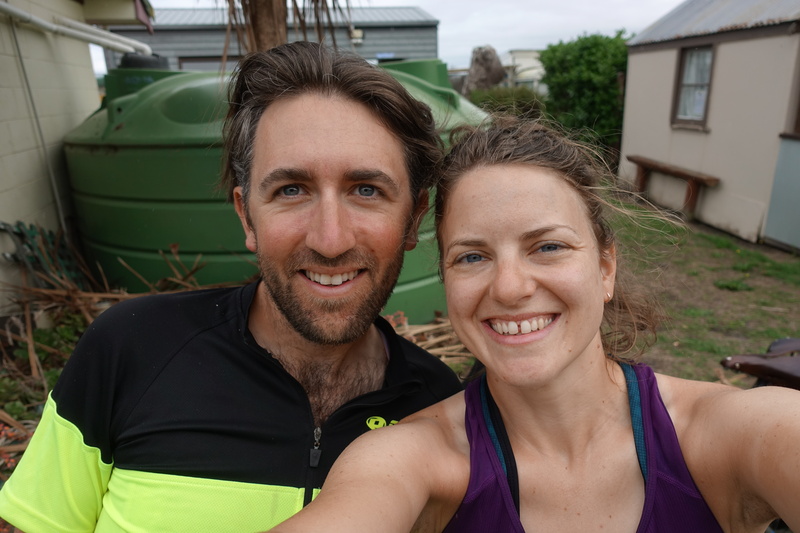 There, we had lunch at a local café and got advice for the next leg of our trip to Pipiriki. 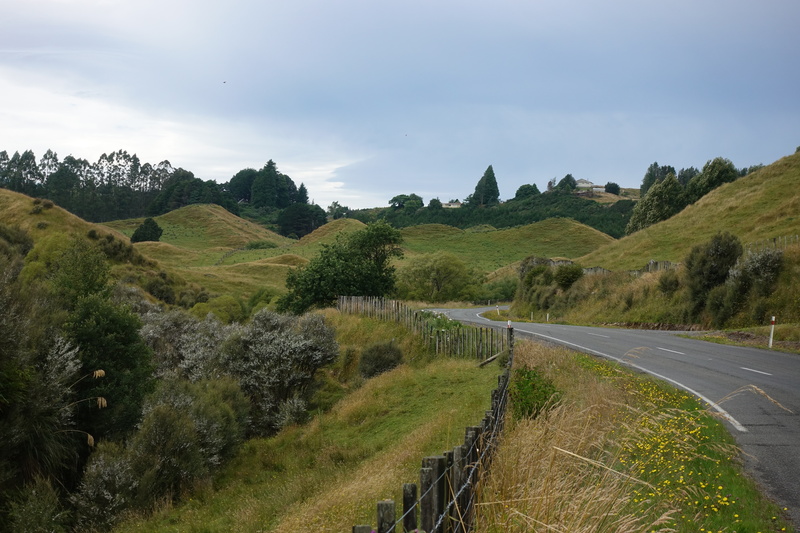 Since we had biked uphill a lot to get to the national park, the road down from Raetihi to Pipiriki was a very welcomed decent. 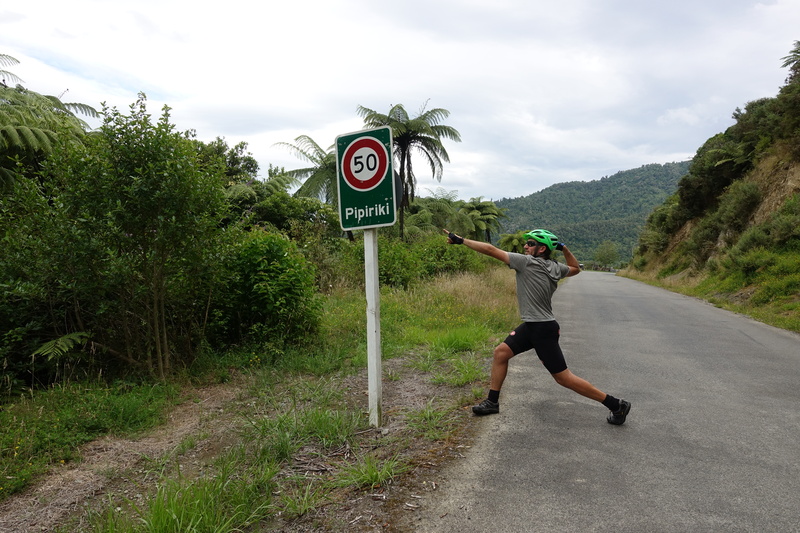 As opposed to the state highways, we didn’t need to hug the road’s shoulder and could breeze down the winding road to Pipiriki. 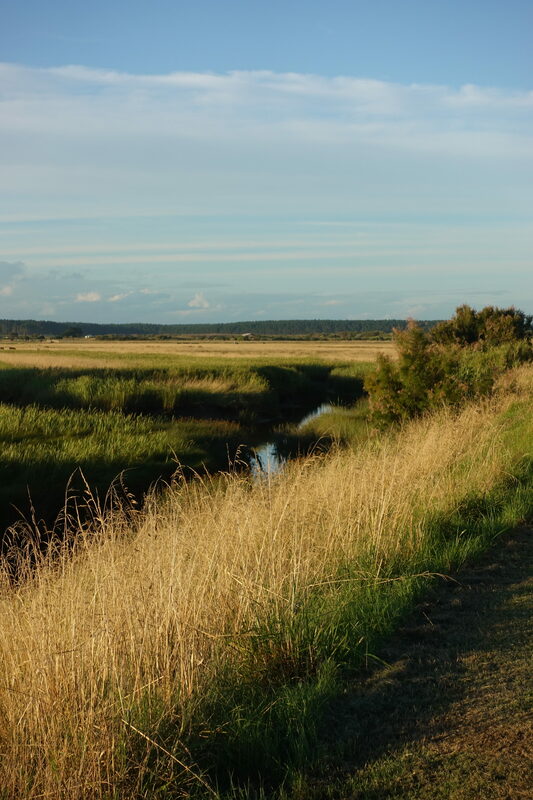 The village of Pipiriki was quiet and sparsely inhabited but as we later learned, it was the home to a large luxury hotel welcoming the British high society on vacation, as well as a trading industry a century ago. 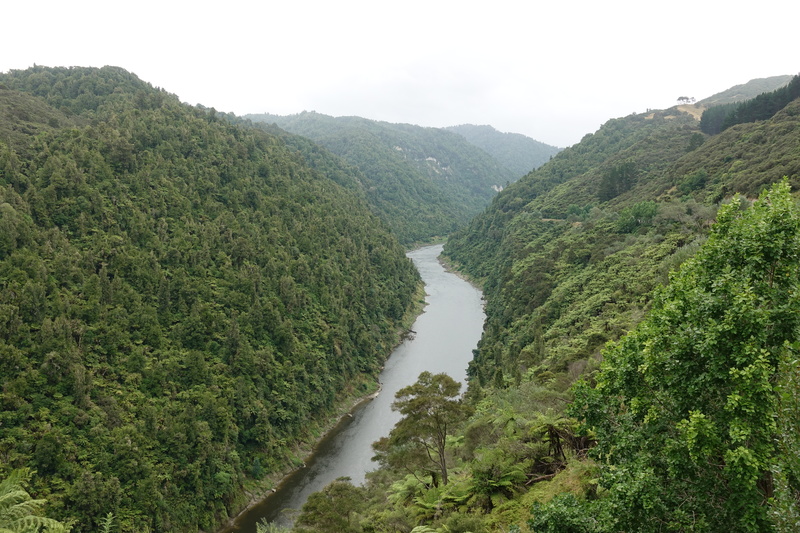 Thursday, we woke up early and started our day off biking down the Whanganui River Road. Despite going downstream, the way was anything but flat (thanks to all advices of car drivers “it’s a gentle road down the river”). 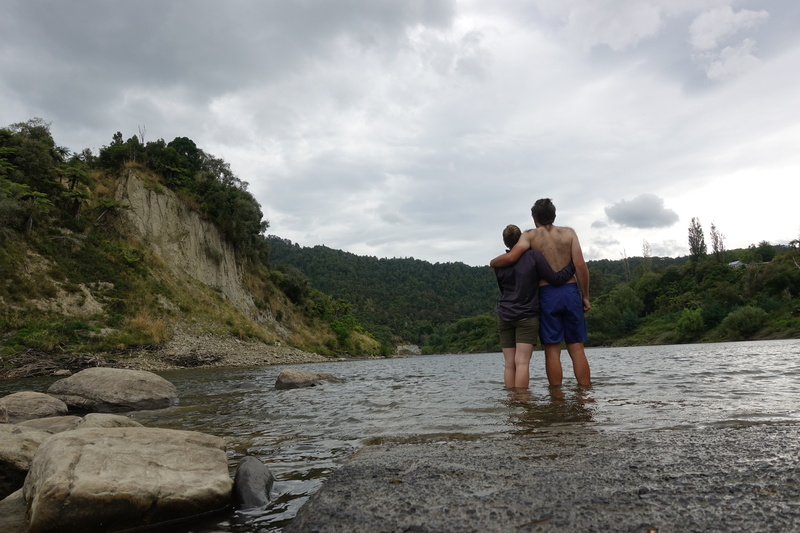 The road took us through some other small Maori settlements along the river and past some parts of the road with significant mudslides, most likely due to the very heavy storms at the beginning of January. 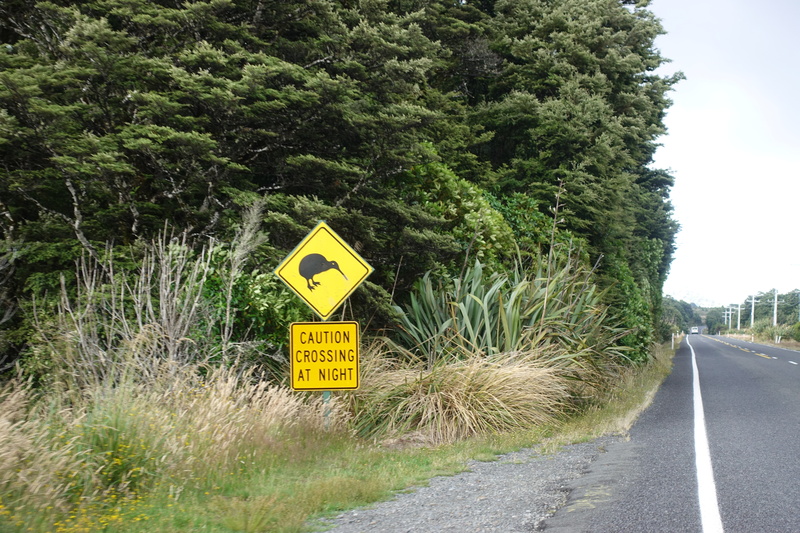 The road is basically a succession of 50m hills up and down with a total elevation of 1000m at the end of the day. 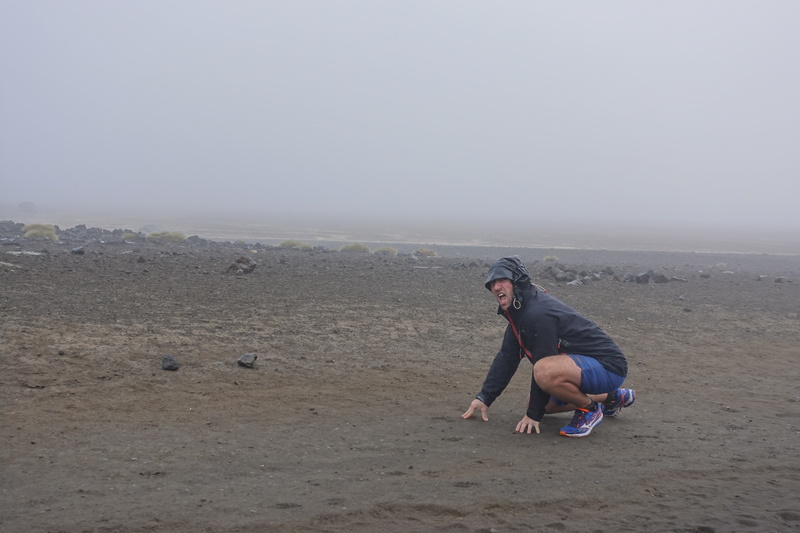 The very last hill in particular was quite punishing since our legs hadn’t fully recovered from the Tongariro crossing – but that meant a coffee break a few kilometers later! 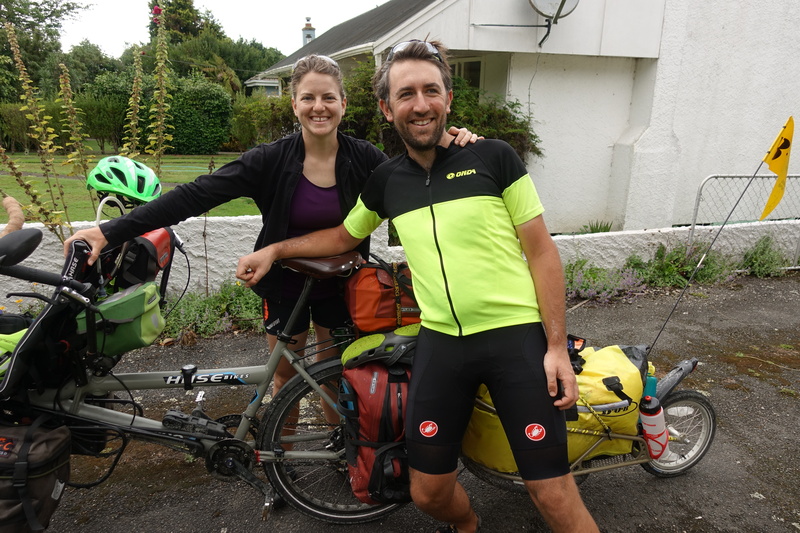 Near the day’s end, we were happy to cycle through the town of Whanganui and receive a warm welcome from Ann and John (and a lovely dinner with lots of garden vegetables, thanks again)! 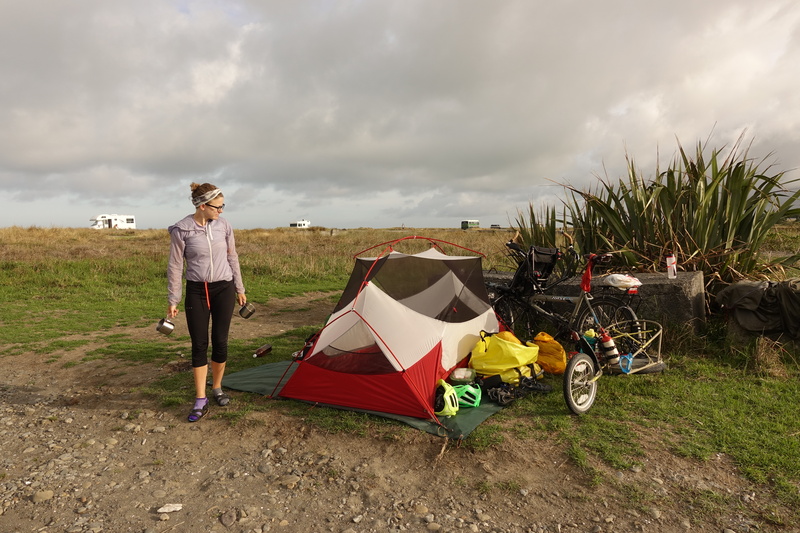 A night of rain brought good-enough weather to continue cycling the next day. 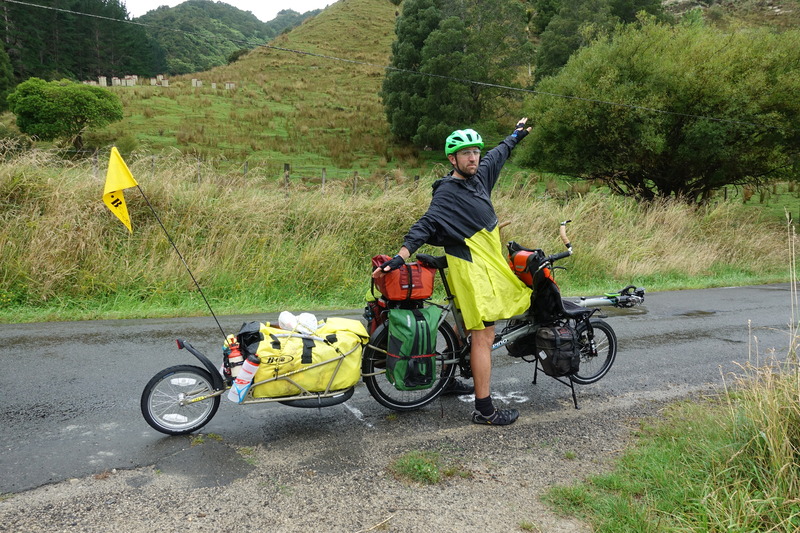 As we made our way out of Whanganui, we decided to attempt taking the tandem and trailer on the Durie Hill elevator as we made our way out of town… and were disappointed to find out that our rig wouldn’t fit (although we kinda assumed that would be the case anyway). 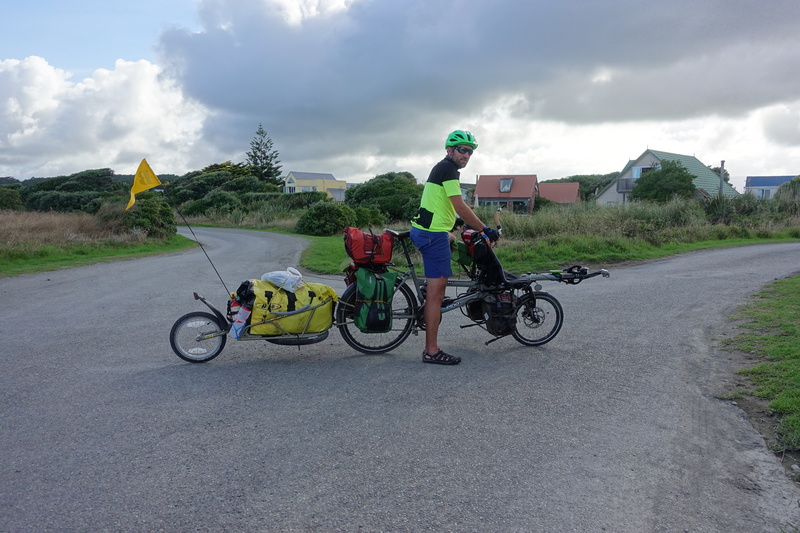 So onwards we went biking on busy state highway 1, only taking a slight detour in the middle to alleviate ourselves from the heavy truck and RVs traffic. For our afternoon pick-me-up, we got treats in the town of Bulls, where everything appears to be a Bull based pun (the town museum: Memor-a-BULL, town hall: Soci-a-BULL, information center: inform-a-BULL). 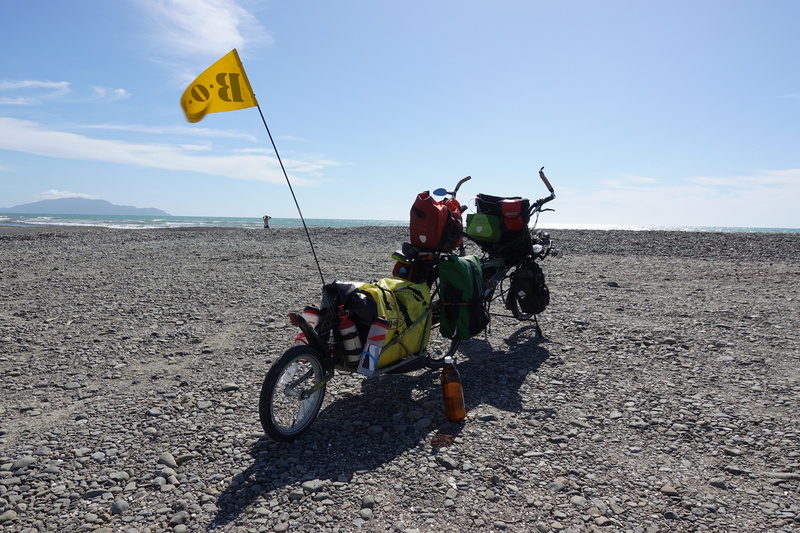 We continued on for a bit more before turning off to Tangimoana for the night, a small remote lay-down beach-vacation town on the coast. 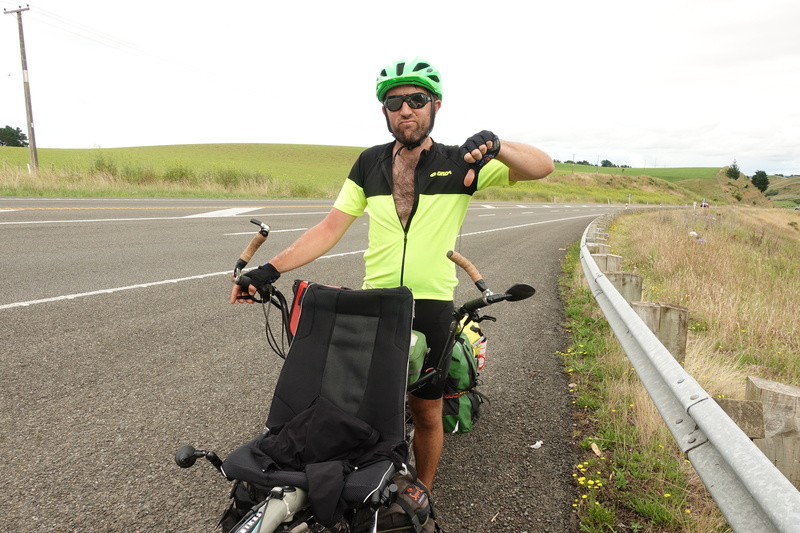 Saturday was another day biking alongside busy state highways 1 and 3, but the food stops in Foxton and Levin allowed us to regain our nerves and continue onwards. 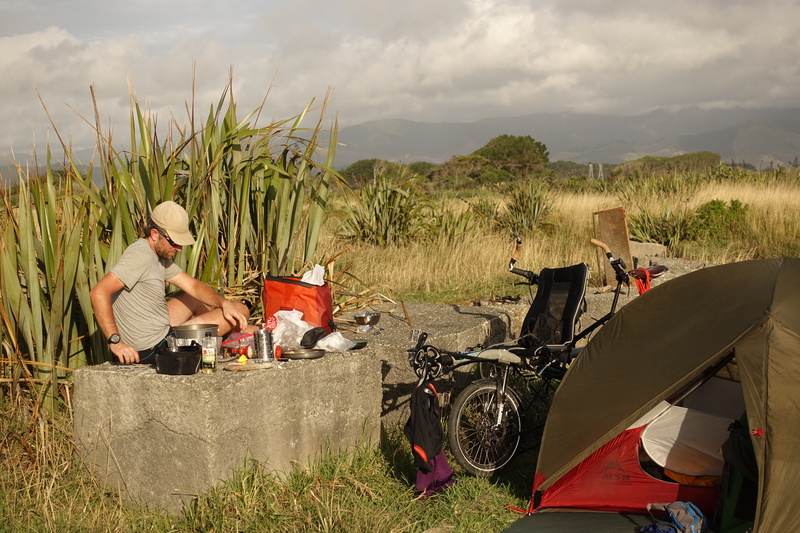 That night, we made it to Otaki Beach, where we did some wild camping on the beachfront and attempted to cook steaks on our stove (we tried to find a new way of grilling meat – burnt on the outside, and mostly raw on the inside… ahhh the romance of camping – we’ll probably try bacon slices instead of 500g of beef next time!). 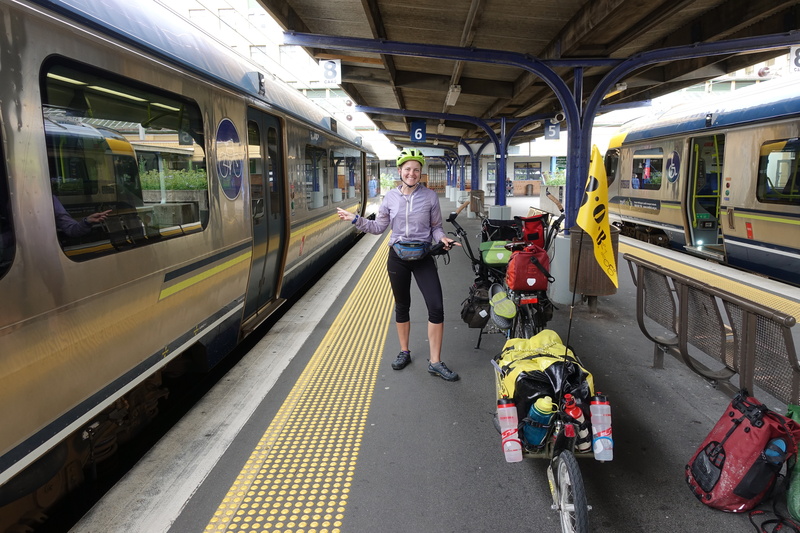 Today, we biked a quick 20 km to Waikanae (including a coffee stop in Otaki) where we were able to take a commuter train for the last leg of our way to Wellington. 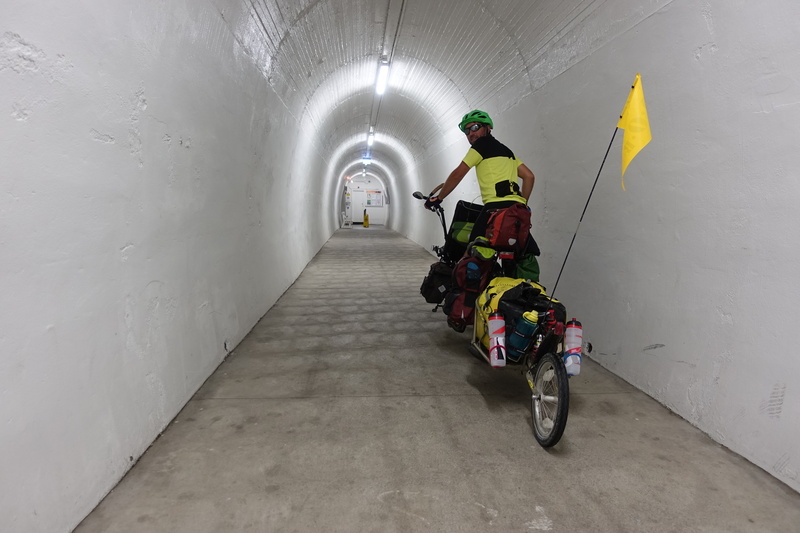 After talking to multiple locals about acceptable routes into Wellington, we surmised that the ride was nearly impossible, would be for sure unpleasant and would mean more risk than we would feel comfortable taking unless we wanted to be biking on the side of a 4-lane highway. 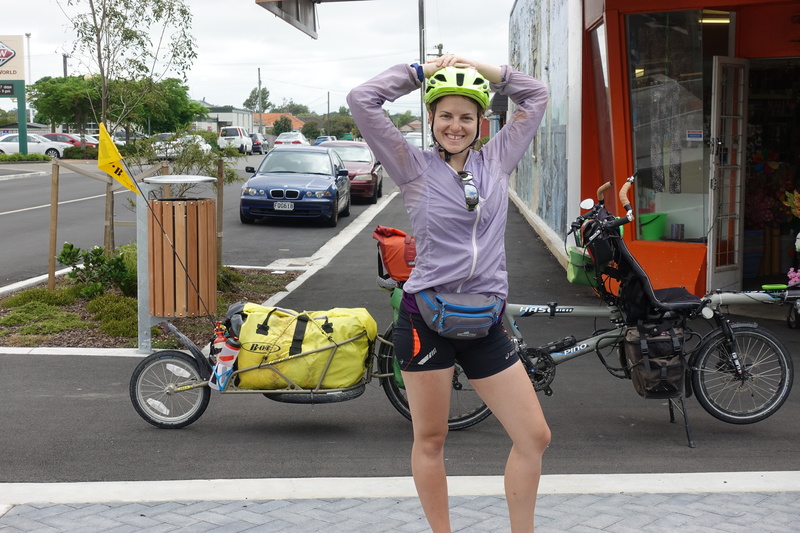 In a quick hour ride, we arrived in the center of Wellington and had lunch at the Harbourside Market before cycling around the city. 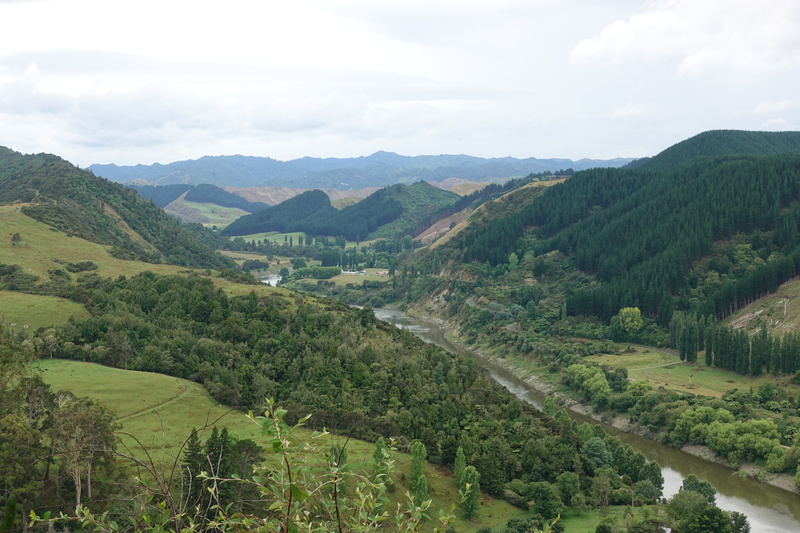 We’re staying here tomorrow – taking a day off cycling for more sightseeing and museums – before taking the ferry to Picton on the south island on Tuesday midday. We were very happy to get you on the phone. We also read your post and looked at your nice pictures (previous one did not contain initially the geysers pictures). We well recognized what you told us. 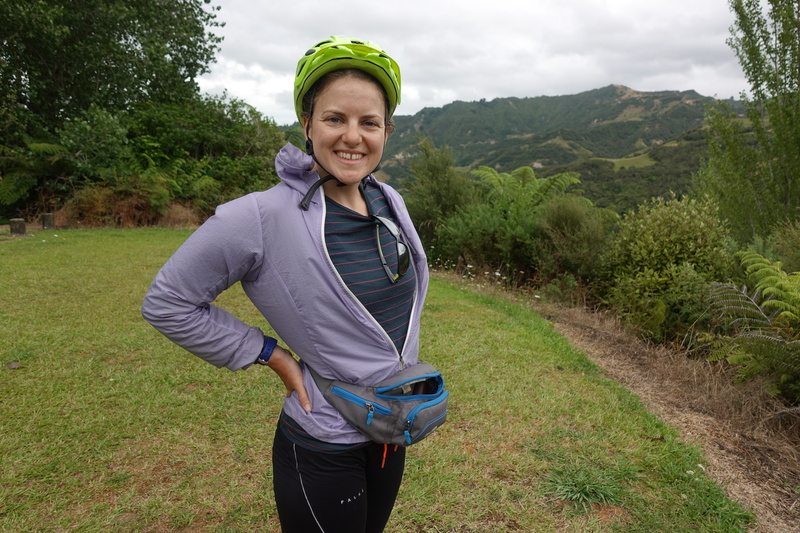 Have a nice visit of Wellington and a good biking down the south. Here in Toulouse, we have faced an incessant rain and strong wind for a few days. We ate today with Jean-Christophe and Melanie who visited our parents and got the traditional new year meal (with usual crayfish). Maxime is nearly 1,9m tall and quite slim. Grand-parents from Toulouse are ok, Alice is still at the hospital but she is much better. We look forward to reading other news and admiring pictures from you! Vous étiez où ? Vous avez fait des randos ou c’est le pays qui est aussi haut ? On passe sur l’ile du sud demain…journée croisière avant un minimum de 1000md+ journalier pendant les prochaines semaines. On est en équateur et rarement en dessous de 2500m, Alexis s est pris d une passion pour les sommets depuis le Triglav (:-p) du coup on fait des sommets aux alentours de 4000- 5000m dans l espoir de pouvoir monter le Cotopaxi. Haaa L île du Sud tres montagneuse, mais c est tellement beau !! Bon courage ! 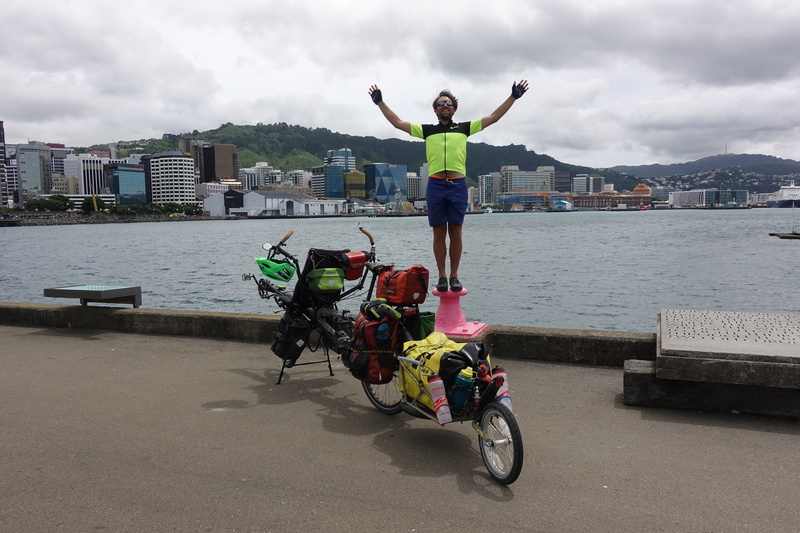 On vient de changer le plateau en prévision des prochains cols…52 dents en allant à Venise, 44 dents en Slovénie et nord de NZ, 36 dents à partir de demain ! On va grimper comme des chèvres :-). – Opencyclemap (http://opencyclemap.org) : répertorie les itinéraires vélo-cyclables et les pistes cyclables. – la fonction ‘Create a route / Créer un itinéraire’ de Strava (www.strava.com) : appli carto sur laquelle vous spécifiez votre point de départ, vos points de passage intermédiaires (optionnel) et votre lieu d’arrivée. Le système se charge de vous compiler une trace cycliste en se basant sur leur base de données qui comprend de nombreux trajets de cyclistes dans la région. Vous récupérez une carte avec le profil de dénivelé et vous pouvez également télécharger la trace sous différents formats pour guidage. J’utilise depuis plusieurs années cette fonction en complément d’autres outils de création d’itinéraires et c’est assez fiable, et surtout, rapide. Je connais effectivement ces deux sites, je trouve par contre Strava un peu difficile pour utilisation sans ordinateur, avec Komoot aussi bon et étant bien plus pratique. Le problème de la NZ est plutôt qu’il n’y a quasiment pas de réseau routier secondaire, encore moins de pistes cyclables (4M d’habitants pour la taille de l’Italie), et le pays étant tout en long et montagneux il y a des goulots ou tout le trafic se rejoint…heureusement qu’il y a quasiment tout le temps des bandes d’urgence propres et larges ou tout les cyclistes roulent (beaucoup de vélos de route ou triathlon). Bravo pour la balade ! on vous suit sur le blog et instagram. Ce sont des contrées inconnues pour nous donc les commentaires et les photos c’est super ! Bon courage pour l’île du Sud.